Currently I am sitting in my desk chair watching Mariano Rivera pitch the 7th inning against Boston in a tie 1-1 game. 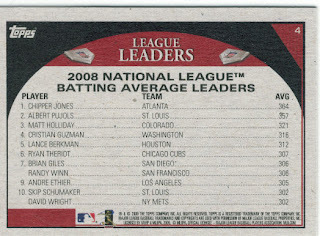 I figured I would share a very generous mail day from Todd, a reader of the blog. My delay in sending his cards hopefully will not make him a non-reader. 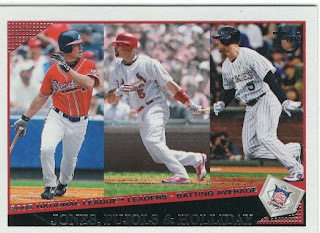 Todd sent over the 2009 Spectrum red /250 Pujols as we discussed, and threw in a 2008 SP Authentic Marquee Matchups Pujols/Lidge, and a retro 2009 Topps #4, Jones, Pujols, Holliday card which makes me want to go find myself a retro blaster. Those cards are way cooler than the base set. I scanned those cards for your viewing pleasure. Todd was also kind enough to throw in some Yankee Stadium Legacy cards which made me smile from ear to ear. I am going to dig some more to look for more cards for Todd, so keep an eye on your mailbox. 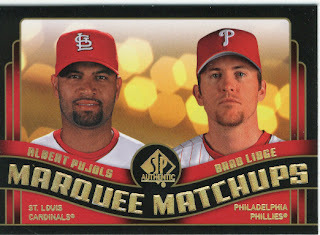 Lidge and Pujols...forever connected by one monstrous home run. 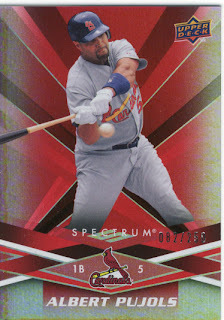 Do you have the Pujols Topps throwback card of him pointing to the sky, and the regular '09 Heritage Pujols? If not, I'll send them to you. But you have to email me your address. I've lost it.